2 Hospitalized After 9,000-Gallon Tanker Leaks Gasoline, Catches Fire in South L.A.
A leaking 9,000-gallon tanker triggered an explosion in South Los Angeles that injured two people, displaced 30 people and sent up heavy plumes of smoke visible from miles away on Sunday morning, officials said. Crews responded to 216 W. Slauson Ave. in the Florence neighborhood after a 911 caller reported smelling natural gas at 7:45 a.m., according to the L.A. Fire Department. 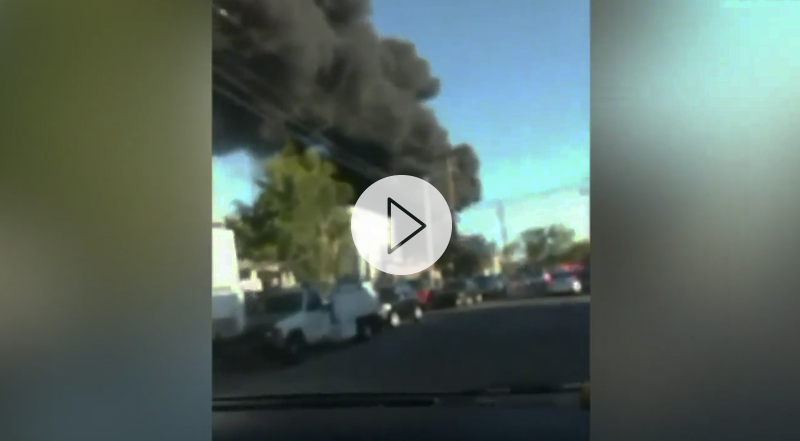 As firefighters surveyed the caller's home, they heard an explosion next door. Crews then discovered a large tanker that had been leaking gasoline. Fumes went into a storm drain and ignited, sending at least one manhole cover into the air, fire Capt. Cory Weireter said. A Friday morning fire at a fourplex near the 110 Freeway in Pico Union is believed to have been started by people in a homeless encampment, investigators say. 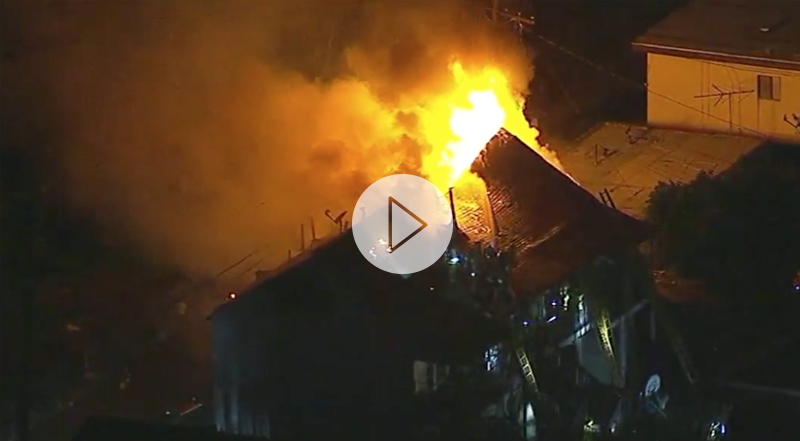 The blaze erupted about 6 a.m. at a two-story structure in the 1800 block of West 20th Street, the Los Angeles Fire Department said in a statement. Forty-seven firefighters responded to the scene, where the fire raged on both floors and in the common attic. The flames were knocked down in 34 minutes, the LAFD said. No injuries were reported. An investigation is underway on Monday after a woman was found burned to death inside a home in Del Rey, authorities said. Firefighters responded to a report of a blaze at a structure in the 11900 block of Weir Street just before 9:45 a.m., according to a Los Angeles Fire Department alert. When crews arrived, they entered the home and found a deceased woman in a bathtub, a Los Angeles Police Department official said at a news conference. She was burned beyond recognition. 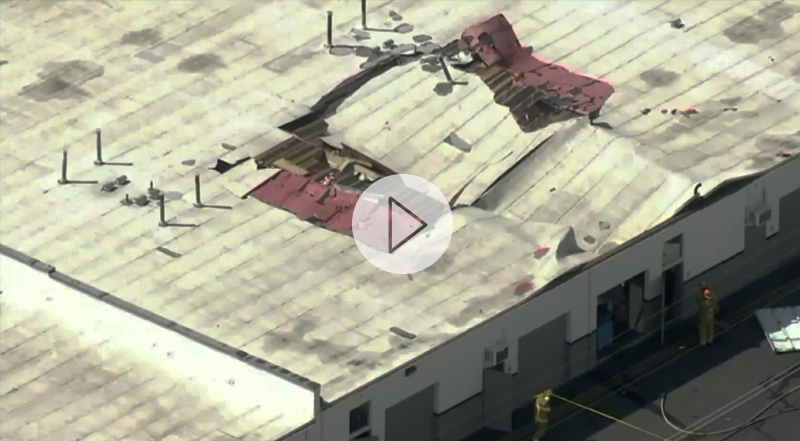 Two men were critically injured Wednesday in an explosion at a one-story commercial building in Canoga Park where they appear to have been running an illegal narcotics lab, Los Angeles Police Department Sgt. Jeff Collado told KTLA. The explosion happened at around 11:00 a.m. on the 7000 block of North Alabama Avenue, according to the Los Angeles Fire Department. The two unidentified men were transported to a nearby hospital in critical condition, according to authorities. 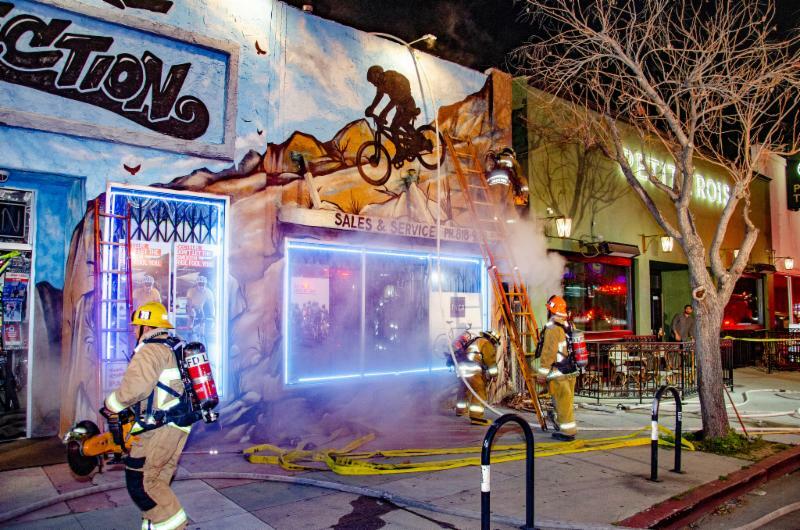 Firefighters needed 44 minutes Friday evening to extinguish a fire in a bicycle shop in Sherman Oaks. Crews responded at 9:32 p.m. to the business located at 13711 Ventura Blvd., just west of Woodman Avenue, and found fire burning on the mezzanine and attic of the shop, according to Amy Bastman of the Los Angeles Fire Department. A total of 36 firefighters were able to keep the flames from spreading to adjacent businesses and knock down was declared at 10:16 p.m., Bastman said. Firefighters battled a large blaze which tore through a carport in North Hollywood early Monday morning. The fire broke out at around 4:30 a.m. at a carport in the 5000 block of North Denny Avenue. 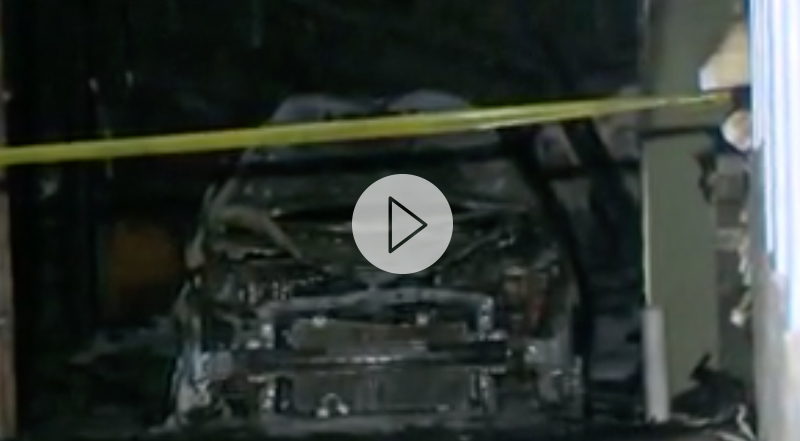 According to the Los Angeles Fire Department, at least five cars were charred and a sixth was damaged. There were no reported injuries. Firefighters extinguished a structure fire in South Los Angeles Friday morning in 20 minutes. Crews responded about 12:40 a.m. to a fourplex at 1745 and 1745 1/2 W. Gage Ave., near Western Avenue, and found fire coming from two units of the one-story building, according to Brian Humphrey of the Los Angeles Fire Department. A total of 55 firefighters were able to confine the fire to the two units and knockdown was declared at 1 a.m., Humphrey said. Ventura County investigators have determined that the devastating Thomas Fire was caused by high winds which made Southern California Edison power lines come in contact with each other . When the lines touched each other, it created an electrical arc. "The electrical arc deposited hot, burning or molten material onto the ground, in a receptive fuel bed, causing the fire," according to the Ventura County Fire Department. "The common term for this situation is called 'line slap,' and the power line in question is owned by Southern California Edison." The fire started on Dec. 4, 2017 and burned for almost 40 days in Ventura and Santa Barbara counties, charring more than 281,000 acres, destroying 1,063 buildings and causing deaths of one civilian and one firefighter. 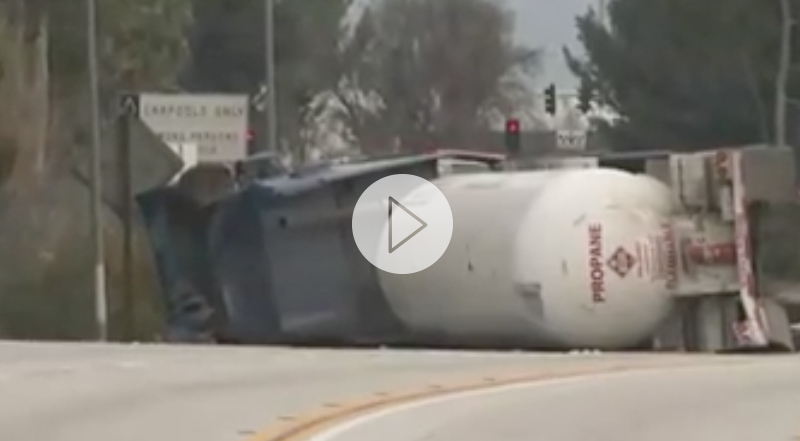 Lanes reopened Sunday afternoon after a big rig tanker carrying liquid propane overturned in a collision on the southbound 405 Freeway in the Sherman Oaks neighborhood of Los Angeles. The crash happened at around 7:20 a.m. on the freeway just north of the 101 Freeway interchange when the big rig crashed into a center divider, the Los Angeles Fire Department said. All lanes were closed while crews worked to clear the scene. California Highway Patrol said all lanes of the freeway were reopened shortly before 3 p.m. The big rig tanker was fully loaded with 9,400 gallons of highly flammable liquid propane, but no propane leak or fire were reported, fire officials said. A 21-year-old man and 18-year-old woman were rescued early Monday from fast-moving water in the Pacoima Wash , a tributary of the Los Angeles River, authorities said. 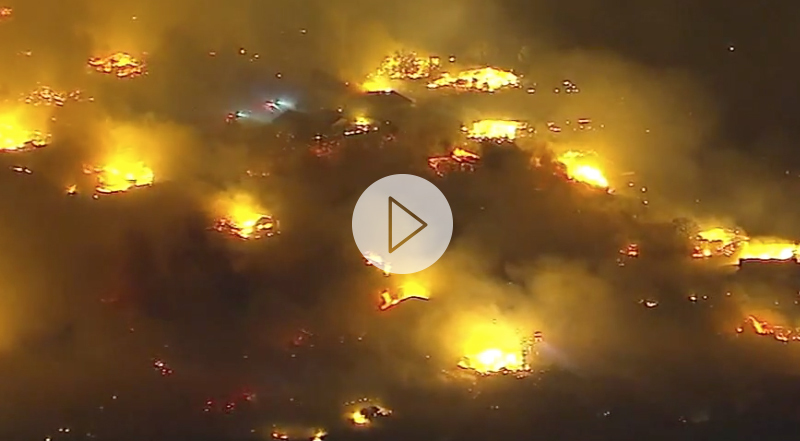 The two entered the wash near Foothill Boulevard and were swept miles down the wash at about 20 mph, Los Angeles Fire Department spokesman Nicholas Prange said. One of them called 911 at about 12:30 a.m. and spoke with dispatchers while moving through the wash, Prange said. The pair grabbed a wall before passing under Telfair Avenue and remained there until firefighters arrived, he said. 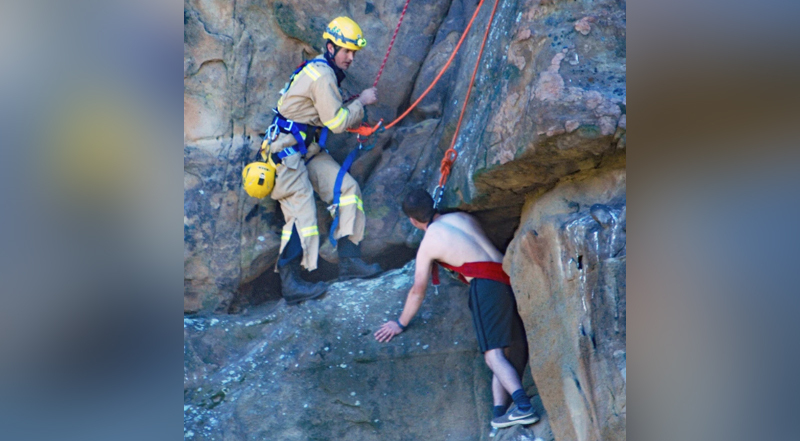 A team of 45 firefighters rescued a hiker who found himself stuck on the face of a rock about 150 feet above ground in the Garden of Gods area in Chatsworth on Saturday. Urban Search and Rescue firefighters used a rope to lower the 19-year- old man from a cliff in the area of the 11000 block of North Redmesa Road, Capt. Brian Wall of the Los Angeles Fire Department said. The rescue was completed about 2:30pm. A man was seriously burned Thursday, March 7, in an explosion at a Wilmington home that may be related to a drug lab. The 2 p.m. blast was contained to one unit of a residential triplex at 1021 N. Blinn Ave., according to Los Angeles Fire Department spokesman Brian Humphrey. The home was not burning when firefighters arrived, but a man was found suffering from 2nd and 3rd degree burns to as much as 60 percent of his body. 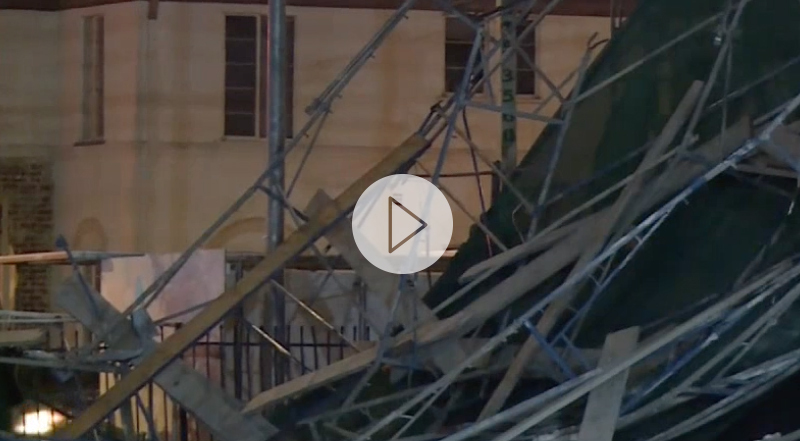 Two people were hospitalized Wednesday after metal and wood scaffolding around a building under construction in Hollywood collapsed . The incident occurred about 2:30 a.m. in the 6700 block of Selma Avenue near Las Palmas Avenue. Two adults suffered minor injuries. A third person was treated at the scene. The injured homeless individuals were sleeping outside the building. 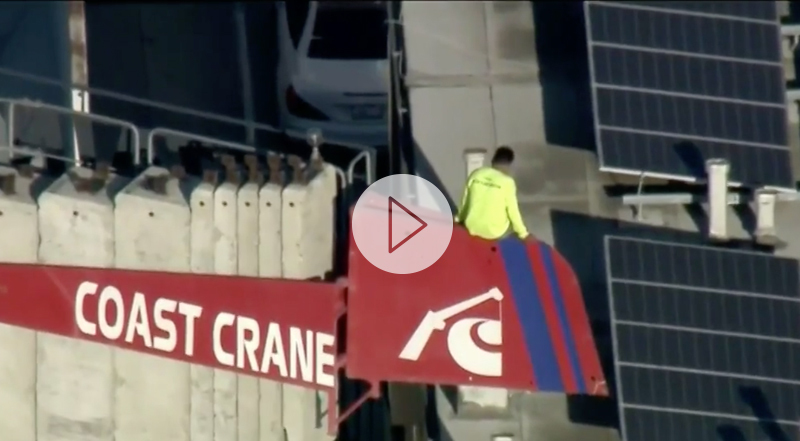 A man who police say may have been considering harming himself climbed atop a crane at a construction site in Koreatown Monday, causing a panic for hours as a large crowd watched from the ground. Firefighters were called about 4:40 p.m. to the 3000 block of West Eighth Street, near Vermont Avenue, and crews evacuated the area beneath the crane, according to Nicholas Prange of the Los Angeles Fire Department. The man was unsecured about 75-80 feet above the ground, Prange said. Firefighters assisted police in contacting the man, who was coaxed into climbing down about 7:15 p.m., police said. Firefighters freed a UPS driver Saturday after a truck became entangled in high voltage wires in Mission Hills, authorities said. 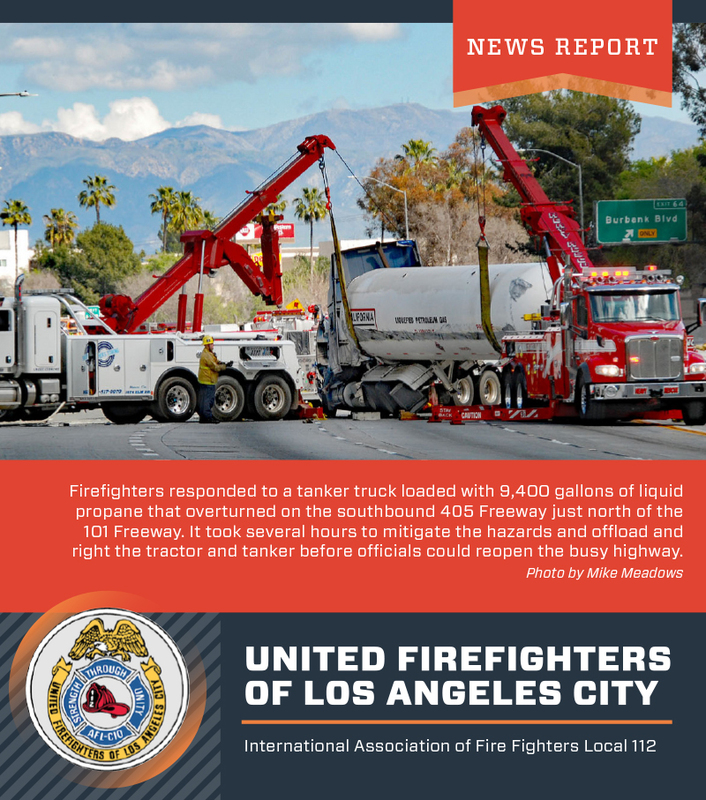 The incident was reported at 9:16 a.m. in the 14900 block of West Chatsworth Street and impacted traffic on the eastbound Ronald Reagan (118) Freeway, Los Angeles Fire Department Capt. Brian Wall said. A delivery truck crashed into a row of garages in Los Feliz on Saturday, leaving a lot of damage and possibly an unsafe apartment building. The crash was reported at approximately 9:45 a.m. in the 3600 block of W. Los Feliz Boulevard. 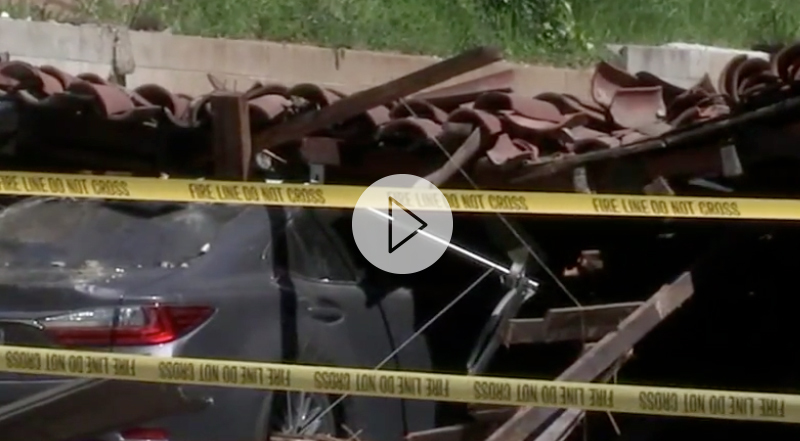 A total of 41 firefighters were at the scene after the delivery truck crashed into the detached four-car garage, causing structural compromise, Los Angeles Fire Department officials said. 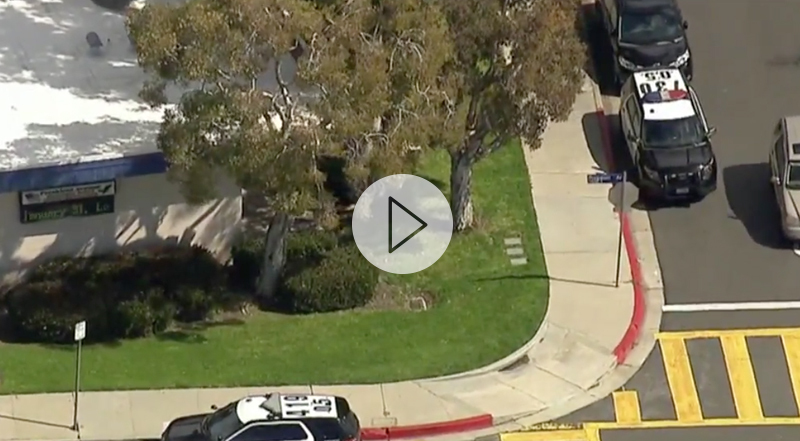 A total of three people were sick at or near Narbonne High School after being exposed to an unidentified substance , Los Angeles Fire Department officials said Thursday. Paramedics responded to the 24300 block of South Western Avenue in Harbor City, where the incident was reported. It's unclear what the substance was, but it was possibly inhaled, fire officials said. No state had it worse with wildfires last year than California, a federal report released this week confirmed. According to the National Interagency Coordination Center’s year-end statistical roundup, more than 1.8 million acres of California was burned by wildland fires in 2018 , surpassing the previous year’s total of 1.3 million, officials said. “That’s the highest in the recorded history of California,” said Scott McLean, spokesman for the California Department of Forestry and Fire Protection. More than 100 people were killed and 17,000 homes and 700 businesses were destroyed in a state where fires are considered one of the annual seasons. Crews responded to more than 8,000 fires last year. 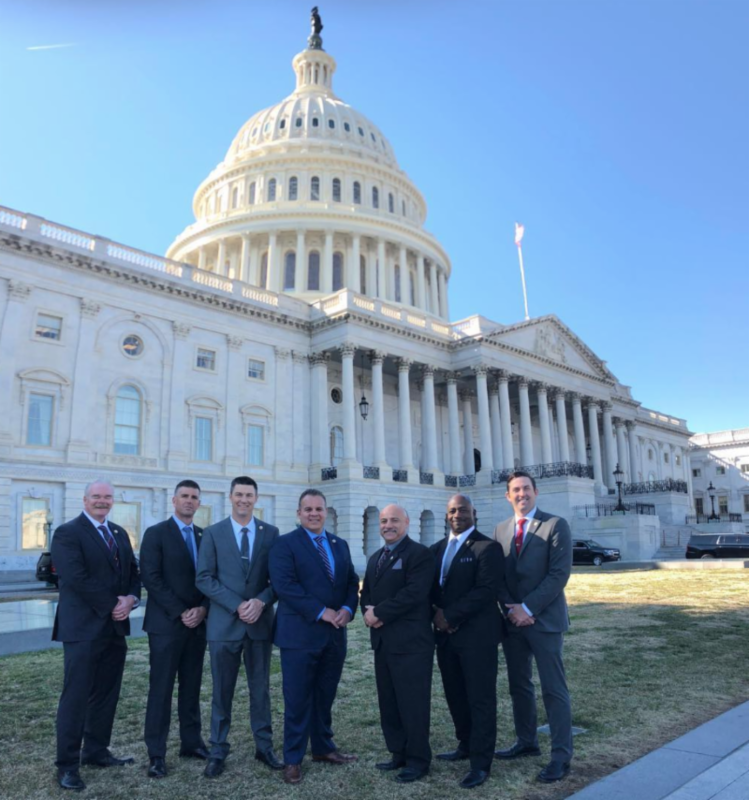 On March 10th-13th, hundreds of Firefighters gathered in Washington, D.C. for the annual International Association of Fire Fighters Alfred K. Whitehead Legislative Conference to advocate directly with legislators on key federal issues that affect their jobs, economic security, and safety. 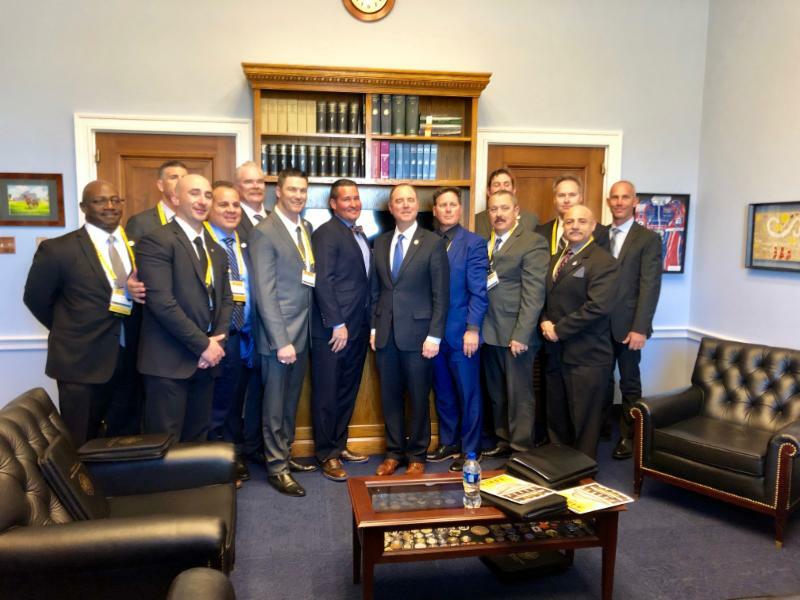 United Firefighters of Los Angeles City, IAFF Local 112 Executive Board Members attended the conference and met with several elected officials, including Congressman Adam Schiff, Congressman Brad Sherman, U.S. Senator Dianne Feinstein, and U.S. Senator Kamala Harris to discuss critical issues facing Firefighters. The priority legislation for the 116th Congress includes bills on public safety collective bargaining rights, supporting Firefighter mental health programs, expanding health care options for retired public safety officers, extending the 9/11 Victim Compensation Fund, and testing Firefighters for exposure to toxic substances. In addition to lobbying Congressional Members on important matters impacting Firefighters, the delegation was fortunate to hear from several elected officials, including Minority Leader Senator Chuck Schumer (D-NY), Mayor Francis Suarez (R-Miami), Representative Brian Fitzpatrick (R-PA), former Second Lady of the United States Dr. Jill Biden , and the keynote address was delivered by former Vice President Joe Biden . To watch highlights from the conference, click HERE . To view a copy of the 2019 IAFF Fire Fighters Issues Book of legislative priorities for the 116 th Congress, click HERE . 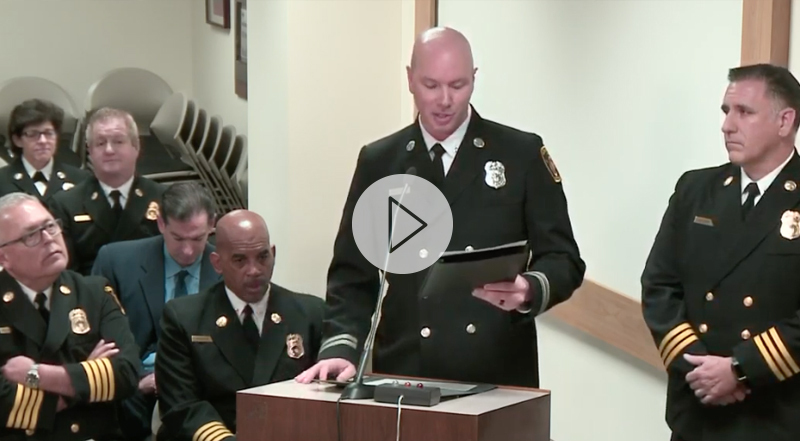 The Board of Fire Commissioners and Los Angeles Fire Department recognized Assistant Chief Jaime Moore for his quick actions which saved a choking woman during the Taste of Soul Family Festival. On October 20, 2018 in Crenshaw, countless attendees were enjoying the food and festivities at a popular community event where Chief Moore was overseeing LAFD personnel and apparatus assigned to the event. It was during this time that Chief Moore and Battalion Chief Al Ruiz heard a woman screaming from across the street. Chief Ruiz immediately summoned fire department resources and Chief Moore ran across the street to find a woman choking, giving the universal sign with her hands on her throat, and turning blue. He immediately performed ‘abdominal thrusts’ which dislodged the food from her airway and ultimately saved her life. 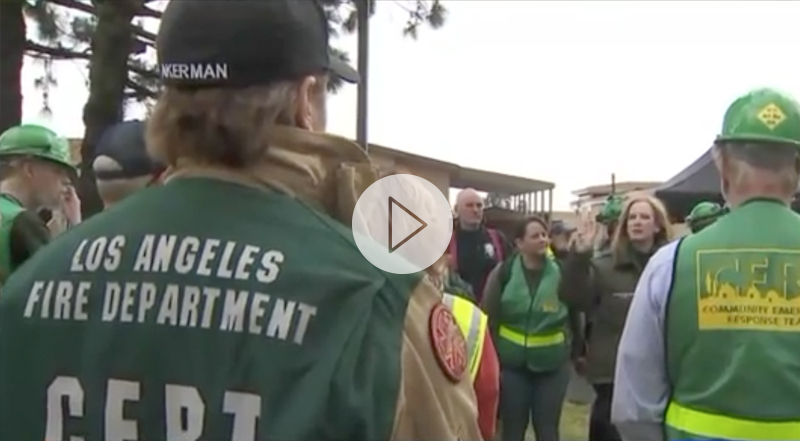 Volunteers and Los Angeles Fire Department officials gathered in Sylmar Saturday for a large-scale, highly-realistic drill to help prepare for a massive earthquake in Southern California. More than 120 Community Emergency Response Team volunteers joined in the training, held at the Oakridge Mobile Home Park, which included realistic disaster scenarios complete with actors playing the parts of injured patients, complete with special effects-style injuries. Some appeared dazed, others were bleeding, pinned under debris or unconscious. The drill provides volunteers with an opportunity to train alongside the professionals in the skills they would need in the wake of a major disaster, like a powerful earthquake in a populated area, organizers said. UFLAC congratulates all of our newly promoted Firefighters and takes great pride in your personal and professional success that you have worked so hard to achieve. 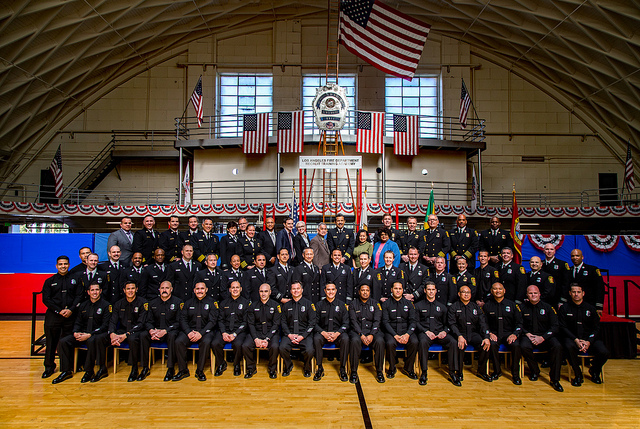 Your demonstrated commitment, integrity, and discipline are attributes that have served you and the Department well as we work each and every day to serve the people of Los Angeles. You represent some of the best and the brightest of our Department. We are so proud of you. For a complete list of promotions, click HERE . 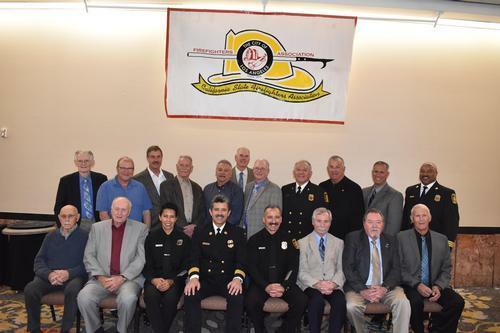 On March 13th, the Los Angeles Firefighters Association hosted their annual Firefighter of the Year luncheon in downtown Los Angeles. This year's award recipient, as chosen by the men and women of the LAFD, is Engineer Steve Canchola. UFLAC was proud to serve as a sponsor once again for this year's event and we congratulate Engineer Canchola on receiving this well-deserved award. The Los Angeles Fire Department (LAFD) is deeply saddened to announce the off-duty death of Firefighter III Richard G. Tucker. 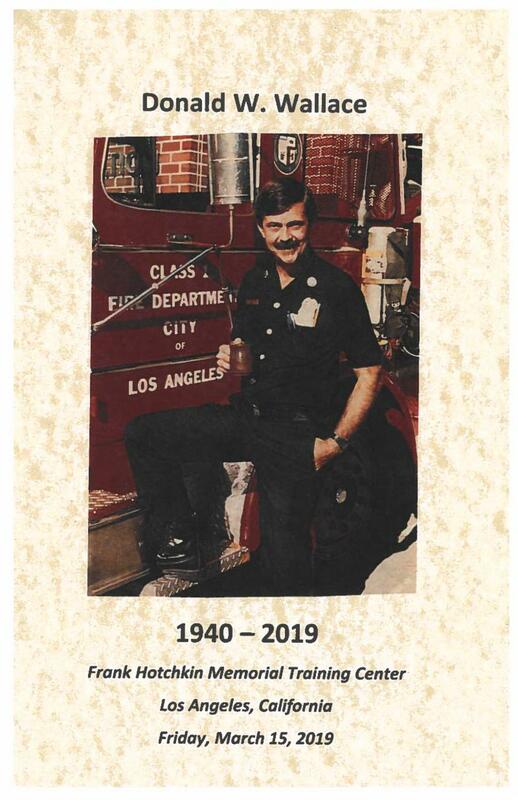 Firefighter Tucker, 59, joined the LAFD on August 13, 2001. He was most recently assigned to Fire Station 69 in the Pacific Palisades. 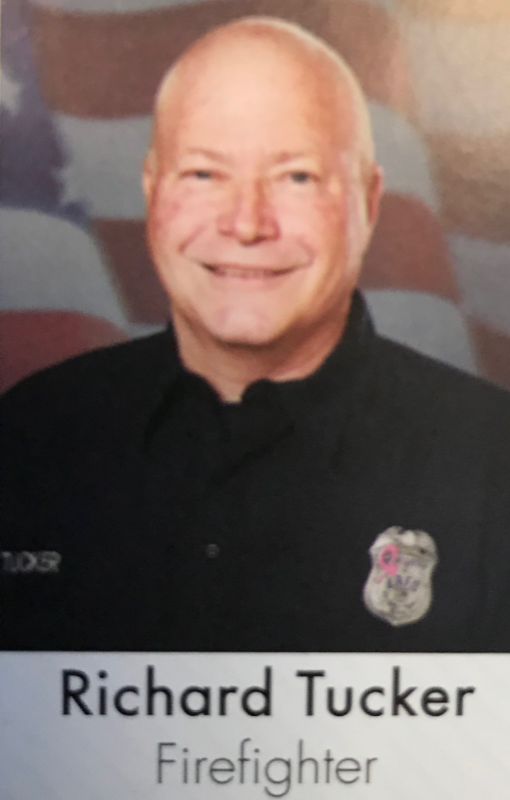 Firefighter Tucker passed away while off-duty on March 12, 2019, in Valencia, Calif. We are grateful to the Los Angeles County Fire Department for their efforts to assist Firefighter Tucker, and LAFD Chief Ralph Terrazas and the men and women of the Department extend our sincerest condolences to his family at this time. 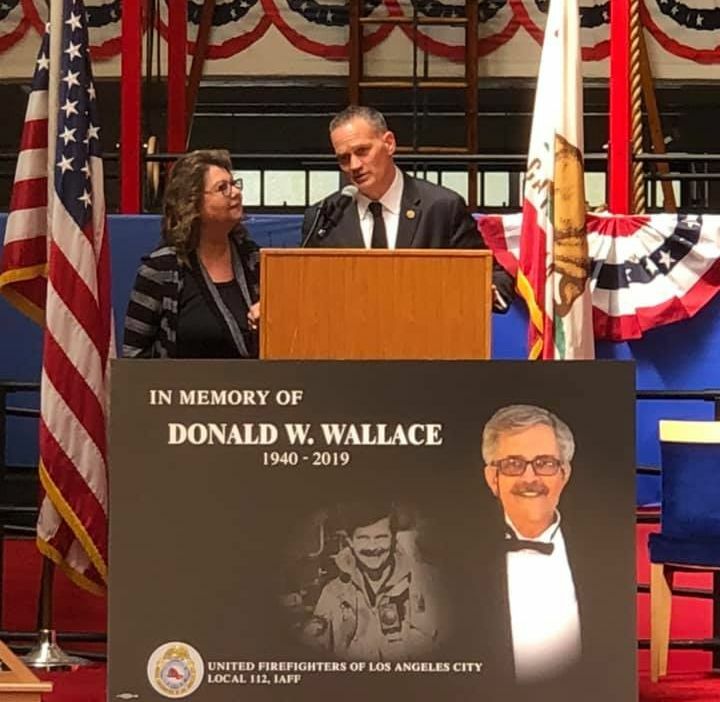 United Firefighters of Los Angeles City, IAFF Local 112 honored the memory of one of our founding fathers and Past President, Donald Wallace. The Memorial was led by IAFF 10th District Vice President Frank Lima with presentations by UFLAC President Freddy Escobar and Los Angeles Firemen's Relief Association Representative Jim Dolan. We will never forget all of the work Don Wallace did for our Union and his legacy will live on forever. About UFLAC: Since 1918, UFLAC has been the labor organization of the proud men and women that serve as firefighters and emergency medical responders protecting the City of Los Angeles. The members of the Los Angeles Fire Department rely on UFLAC to focus on the wellbeing and safety of those that protect the lives of others. For more information, visit www.uflac.org .